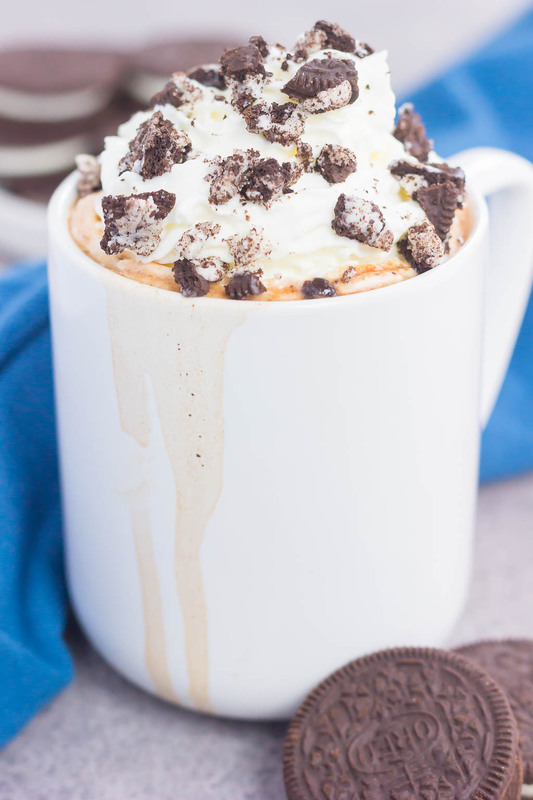 This Cookies and Cream Hot Chocolate is creamy, decadent, and ready in less than 10 minutes. 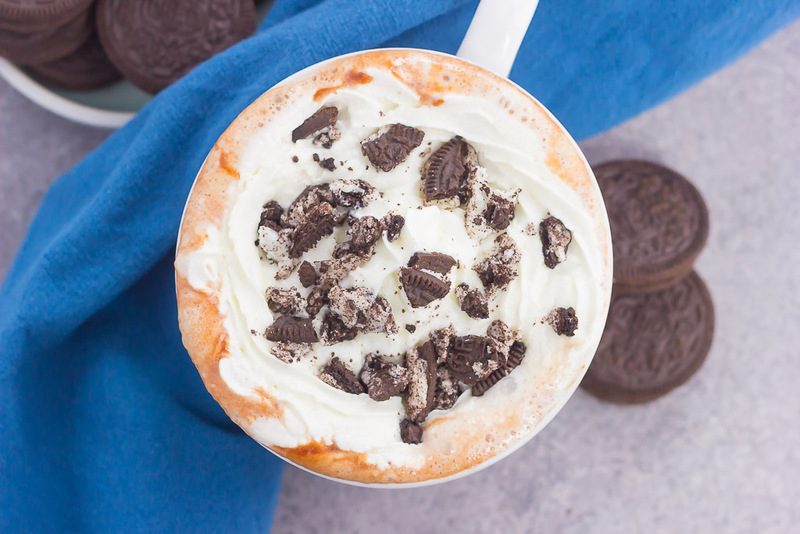 Made with two kinds of chocolate and sprinkled with crushed Oreo cookies, this dreamy drink is the perfect cure for those winter blues! Let’s pretend it’s a lazy weekend day, you’re snuggled up under the covers, and you have a big mug of hot chocolate in front of you. Maybe it’s snowing outside, maybe it’s raining, maybe it’s sunny and warm depending on where you live…but when you’re all cozy under the covers with a steaming mug of something sweet, that’s all that matters in the world. At least in that moment…right? And that is my idea of the perfect morning or afternoon! While that doesn’t happen as often as I would like, I try to cherish those lazy moments. And sipping on something hot is a must for me practically every day, even in the summer! I’m the type of person that is always cold, so you can usually find me bundled under my electric throw blanket come winter time (and even occasionally in the summer). I will admit that coffee is my morning must-have, but in the afternoons or evenings, I often sip on hot chocolate during the winter. 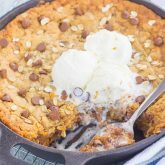 The thick texture and cozy flavors warm me right up and put a smile on my face. It’s the little things in life that make me happy! I love the classic hot chocolate flavor, and this Peanut Butter Cup version makes me swoon, as does this Frozen Salted Caramel Mocha Hot Chocolate. 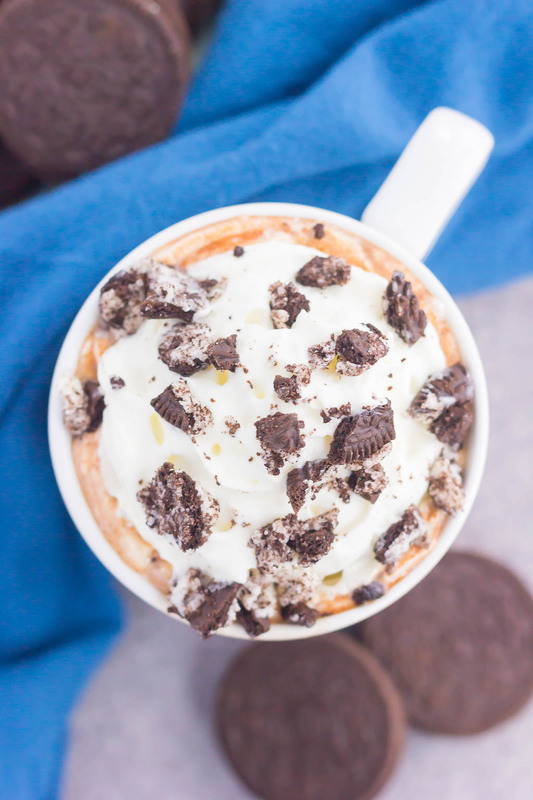 So I guess it’s no surprise that I created this Cookies and Cream Hot Chocolate, right? One sip of this deliciousness and I was hooked. Hooked! 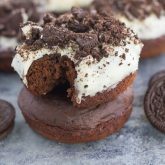 You can’t go wrong with two kinds of chocolate, simmered with milk for richness, and then topped with fluffy whipped cream and Oreo cookies. I may have had one (or three) glasses of this in one sitting, it’s just that good. And really, homemade Cookies and Cream Hot Chocolate is way better than the packaged kind, friends. It takes just a few minutes to make and then you’ll be in hot chocolate heaven. 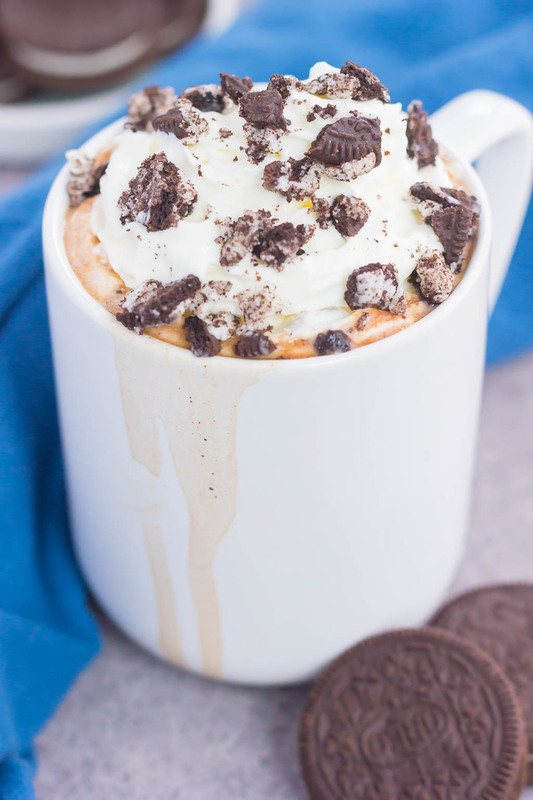 So if you have a lazy day ahead of you or want to relax after a busy day, this Cookies and Cream Hot Chocolate is the perfect treat to sip on. Cozy, creamy, chocolatey and oh-so delicious, it’ll be you’re go-to decadent drink all season long! 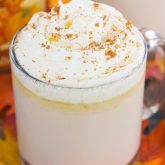 Looking for more cozy drinks? I’ve got you covered! In a small saucepan, combine the milk, white sugar, chocolate chips, and cocoa powder. Warm over medium heat, stirring occasionally until chocolate is melted and smooth. Remove from heat just before milk begins to boil. Add vanilla extract and salt. Stir to combine. Pour mixture into two small glasses or one mug. Top with whipped cream and crushed Oreo cookies. I don't drink hot chocolate enough and I could really use one today because the ground is completely frosted over! 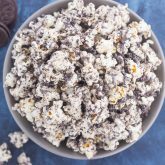 Cookies and cream is one of my favorite combos so this is completely calling my name! Thanks, Marcie! I can never resist anything with cookies and cream! For some reason it feels like Sunday today :) This weekend was so short! This hot chocolate looks awesome! Love the Oreos on top! Yes to the weekend being too short! :) Thanks, Mira! Sounds decadent, cozy, and delicious! Great video, Gayle! Mmmmm hot chocolate! It's always such a fun treat to make! And cookies and cream?! So much fun!! I need this in my life right now! Gosh, this looks really delicious. Can't wait to make one. Unfortunately, I ran out of Oreos. Will just dream about this instead. Thanks for the hot chocolate love, Sheila!